My parents have always been supportive of my hair-brained ideas, but I am absolutely positive that if had I told them I was going to set out on a year long cross country golfing expedition at the tender young age of 17 the proverbial foot down would have been put down. Luckily for us Dylan Detheir’s parents were quite a bit more adventure minded than mine and because of that we get to read 18 In America. 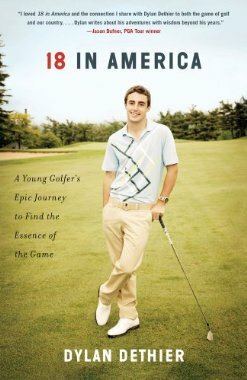 As a 17 year old high school graduate Dylan left his home in small town Massachusetts and struck out on the road with a plan to see the country and do so by playing golf in each of the lower 48 states. From there, as they say, adventure ensued. From a high stakes golf game in Vegas to a teenage crush on a local Arkansas news anchor named Holly Sonders (yes, THAT Holly Sonders) this book is a great coming of age tale based around the most epic of golf trips. A quick and easy read that does not disappoint. I nearly flipped out when I saw this recommendation on your home page!! As it happens he is one of my really good friends and we play together on the golf team at Williams College. Really cool to see 18 in America getting some notoriety from people other than those close to the team. Keep spreading the word! It means a lot to me and I know it means ten times that to Dyl. It’s a fun read and Dylan should be proud of what he’s done. Hopefully he will get some more press from the golf media. Its a great story.